in my etsy shop, SPROUT HEAD, i am having a 15% off everything sale! just enter the coupon code HOLIDAY2011 upon checkout. this sale runs through december 5th only! i have some new prints and a poetry chapbook called NON SENSE. I'm selling zines and prints during Reading Frenzy's 16th Annual Cheap Art and Craft Sale! Handmade gifts for under $50! i contributed a limited edition print to the 10th Anniversary Celebration of Art-O-Mat in Richmond. 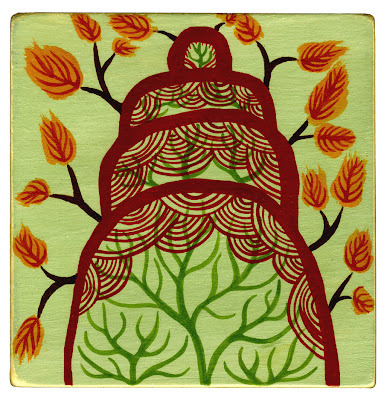 Buy art from well-respected Richmond artists for only $5 each! see previous post for more info. ART 180's 8th annual silent art auction fundraiser and "good karma party." Eclectic silent auction of art, services, and dining; music; hors d'oeuvres; a cash bar, tarot readers, henna tattoing, body painting, chair massages and more! 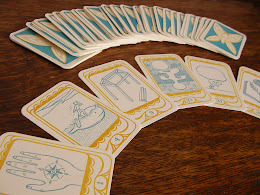 i will be reading fortunes with my self-illustrated deck of cards. Art 180 is an organization I first got involved with last year when i illustrated their calendar. this year, my friend Sarah Hand illustrated the calendar, and it is truly awesome! All proceeds go towards expanding the scope of Art 180 to provide art programs for at-risk-youth. Featuring live musical and dance performances, visual art exhibitions, select Virginia micro-brews and wine, a snow-globe making workshop and wrapping paper station! This opening night is held in conjunction with Richmond’s First Friday’s Art Walk. A European-style outdoor market - live Christmas trees and wreaths, art and crafts from 50 vendors, food and drink, and a real Saint Nick! Food, music, and art-making for the whole family. 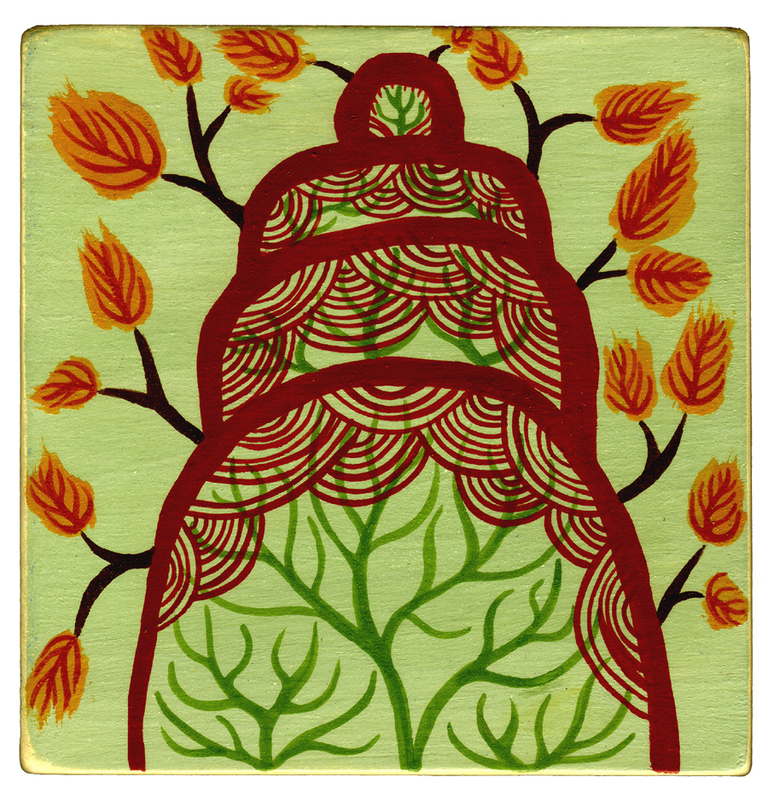 Five free hands-on workshops: Shrinkle Shrine Necklaces, Festive Collagraph Cards + Gift Tags, Embossed Metal Ornaments, Fiber Celebration Garlands, and Felt Monster Pins + Puppets ~ and one $5 workshop: Silk Painted Light Catchers. Bring your own T-shirt to screenprint our Explore your creative spirit motto. Come make something! one of the best (in my opinion) indy craft markets in richmond. Come support local and regional art vendors and do some holiday shopping! Hours: 10-6 Monday through Thursday, 10-8 on Fridays and Saturdays, and 12-6 on Sundays. it's a truly magical sight - all sorts of curious and pretty handmade goodies in one small space. 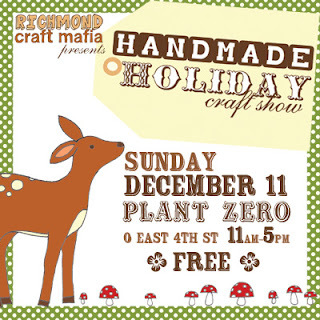 Over 50 artists and crafters included. 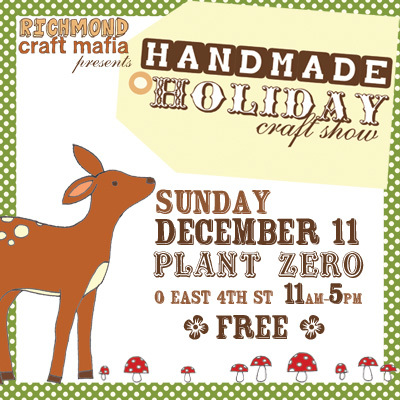 Terrariums, animal-friendly antlers, handknit handwarmers and hats, jewelry, screenprints, soap, t-shirts... you'll discover something new everytime you visit! it's on the wall to the left right when you enter the shop. a bunch of artists have donated original artwork that you can bid on, and all proceeds go toward the scholarship fund for the Richmond Young Writers program. An outdoor market in Oregon Hill featuring clothing, antiques, collectibles and vintage items. A holiday shop of local and regional artists. at the Visual Arts Center of Richmond. 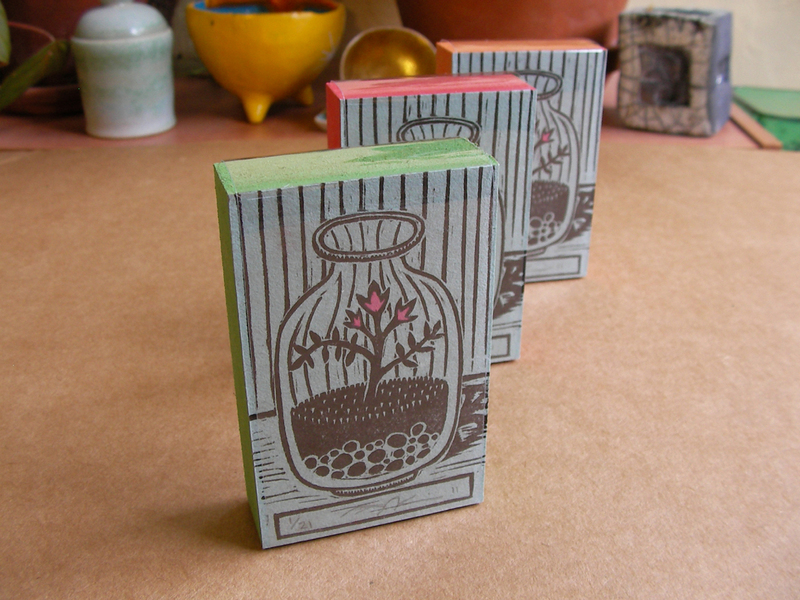 I am teaching relief printmaking, monotype printmaking, bookbinding, and paper bead jewelry from January through May. Members of VisArts may register early, all others register starting on Dec. 7th. I will also be teaching relief printmaking at the VMFA Studio School. I'll post more details and photos from classes soon. wow! i'm tired just reading about it all!